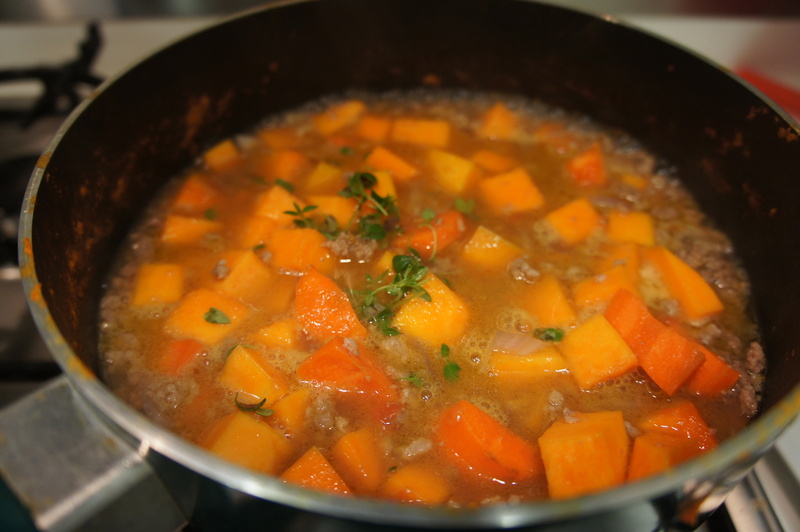 Beef Casserole and Butternut Squash for Little B!! I just tried this recipe last night.. For the first time, I’m introducing red meat to Little B! 🙂 and she loves it!! I just wanna share the recipes with mommy out there.. 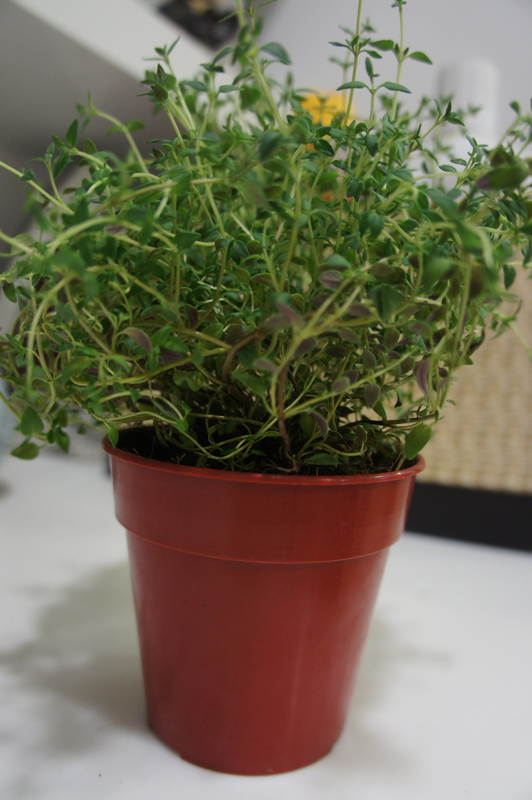 I got this one from Annabel Karmel Cooking Book.. So, tried and tested.. approved yummy!! 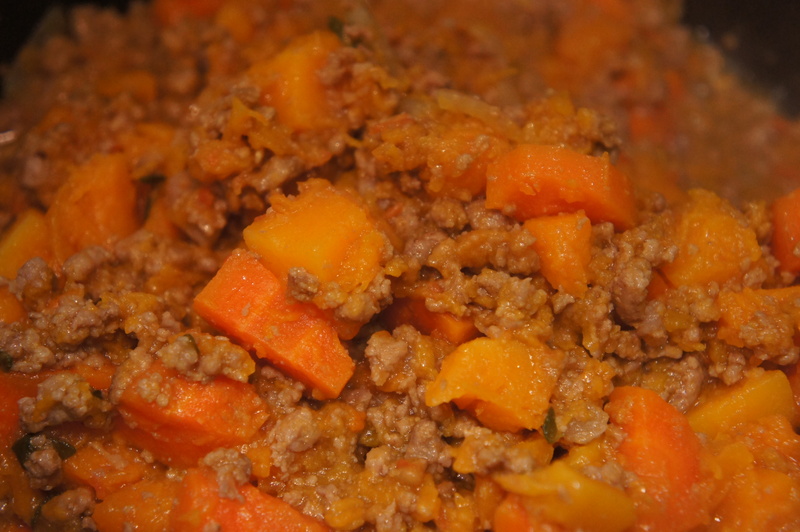 It’s very easy.. You just need minced beef, butternut squash (as I said before in my previous entry, nak guna pumpkin biaser pun buleh.. butternut squash ni pumpkin omputih), carrot, beef stock (air rebusan tulang daging, it gives the sweetness to the taste but please don’t put salt when you’re making it! ), tomato puree (also home-made, blended tomato, fry with onion and shallot until it becomes thicker) and thyme leaves..
First, what you should do heat up the saucepan with olive oil.. (yeah I use olive oil for all B’s food), the the onion and minced beef. Fry over a medium heat until they start to turn brown.. Step two, just add the butternut squash (or any pumpkin), carrot, beef stock, a little bit of tomato puree and thyme leaves.. Step three, just bring to boil all the ingredients together.. Step four.. blend until smooth to your baby’s liking! Wallaaaaa…. This much of food can last for 3 days for B.. and that is for 6 meals. I froze B’s food and heat it back whenever I need it. I have to do that because I can’t afford to cook everyday. 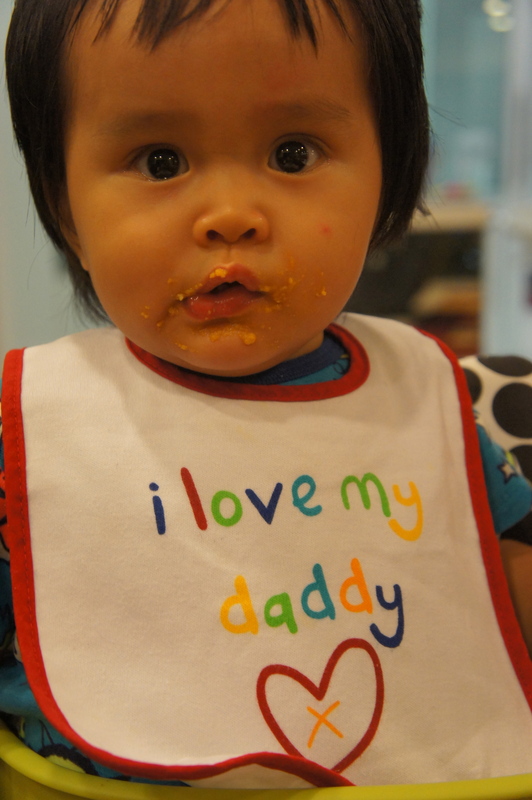 With work and oncall, this method works best for me, easy for daddy when he needs to feed B too..
Posted on April 15, 2012 by Dr Halina Mohd YunosPosted in MommyhoodTagged recipe, solids. Yummy, berselera Bella mkn :)..Dr halina, ada tk kadang2 Bella buang air besar keras? tak lar keras sgt.. she’s taking prune juice. so passing motion is not a problem for her..
Dr. I saw u semalam. At the curve. Bella cute sangat!! Doc,I thought olive oil is not good and in fact can be harmful when heated.its good to be taken cold ie not expose to heat. I have since used grapeseed oil for cooking,and olive oil for salad dressing or use on cooked food. You would probably be more learnt on this ,and if you find info abt it, can share,ye. sorry mencelah..if i’m not mistaken..there is olive oil can use for heating (for cooking) and olive oil use for salad dressing..if i’m not mistaken there is 3 type olive oil…kindly check at hypermarket and google how to use each of the type..
Yums yums..great menu doc..wished I could make variety homemade foods like u..
Bila baca entry pasal ni, tak sabar rasanya nak introduce green veggie to my baby. She is now 6 months. Rasanya dah boleh ke introduce veggie for 6 months baby? out of topic but need to ask for assurance…is the jollykidz magic panel playpen worth buying? kukuh tak? Salam Dr., saya selalu mengikuti perkembangan blog Dr. yang best dan penuh info. Boleh tak share, resepi apa lagi yang Dr. introduce to B selain carrot and s/potato + broccoli semasa umur die 6mnth ++. Thanks. just curious, lagikpon tak sempat baca all of your entry, just skip to the cooking method :). Minced beef pun home-made? Kalau bukan,which brand you beli eh?Thanks! nk tnya dr guna olive oil jenama ape ye? ssh nk cari yg ade tulis halal la..
Their tastebud is very sensitive. You dont want to load them with salty food.. Let them taste the natural ones first..
hm..my little hero tu muntah masa 1st time i test him for beef. mcm mana nk buat. ?alahan ke tu? later than siap demam+muntah+cirit. plz doc,advice me! tqvm in advance. nway..bby pun bleh mkn labu jgk yer! Dr.Halina..I nak tnye u, cmne I nk bt klu anak I xnk minum air suam ek?die akan sembur balik..then Doc, cemana doc bt air prune utk Bella? boleh tak saya nak tanya soalan ckit..
anak saya 1y 4m selalu sembelit.. kenapa ye? nak tanya, mana Dr halina beli tmpt utk freeze mknn baby? & what’s the best way to reheat frozen baby’s food? I got a Beaba multi portion container for frozen food. And tommy tippee food container for refridgerator food. I just hear up using microwave but must be careful of hotspots.. Kena kacau btul2..